for their video needs. With more than 1 billion unique users each month from across the world and with 40% of that traffic on mobile, YouTube is one of the best places to reach your target audience with high-quality, compelling video. We’ve heard lots of feedback from loyal Google Analytics users asking for better TrueView reporting, which is why we’re so excited to announce a new Google Analytics Video Campaigns report that focuses on your TrueView ads. With this new report rolling out over the next few days, users can now see the detailed effects of their TrueView campaigns on their website traffic and revenue. 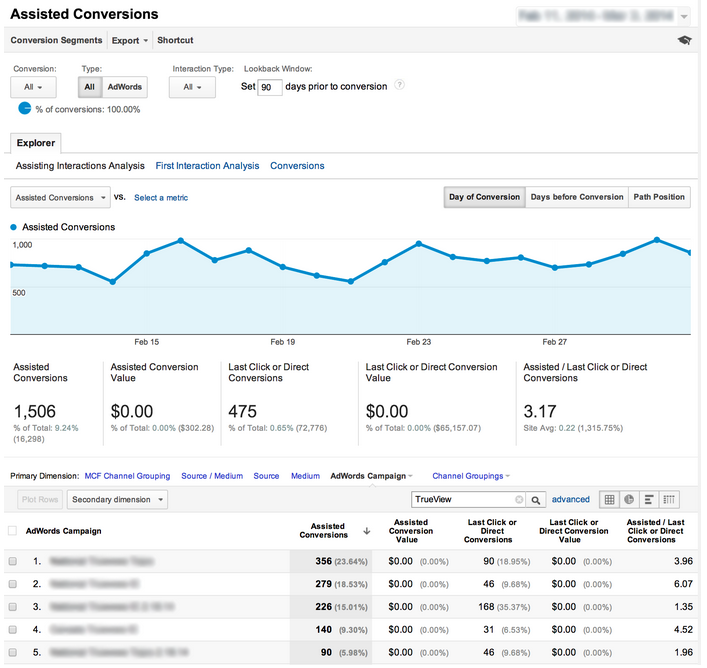 You can access the new report under Acquisition > AdWords > Video Campaigns. If you’ve never created a TrueView ad, it’s easy to do with AdWords for Video. 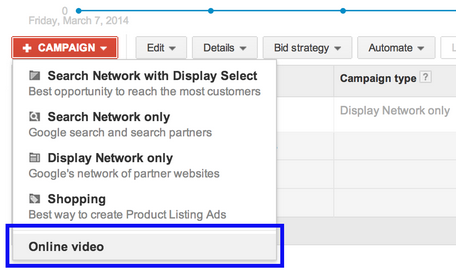 Just head into AdWords, and under the +Campaign button, select Online Video. Once you’ve created an auto-tagged TrueView ad in AdWords and linked your Google Analytics and AdWords accounts, your TrueView-ad-driven traffic will show up in the Video Campaigns report after about 24 hours. This report has the familiar look and feel of the other AdWords reports but includes TrueView-specific metrics like Paid Views, Cost Per View, and Website Clicks. There are also new metric groups like Engagement, which helps you understand how users engage with your video and your website. Using this newly available data, you can fine-tune your TrueView campaign settings to optimize for views, clicks, or goal conversions. You can also segment the reports by Ad Content or Video, helping you analyze the quality of your video creatives in the context of your website goals. In addition, since TrueView ads are often more brand-focused, traffic they generate to your site will often be indirect traffic. In order to analyze this type of traffic, check out the new Google Display Network Impression Reporting pilot, which can help you understand conversions that resulted from unclicked impressions or video views. With this report, it’s possible to see how your TrueView ads are generating value beyond just direct clicks; you can dive deeper to understand how impressions, views, and clicks all contributed directly or indirectly to conversions on your site. To get started with Video Campaigns reporting, simply link your AdWords and Google Analytics accounts and start an auto-tagged TrueView campaign via AdWords for video. 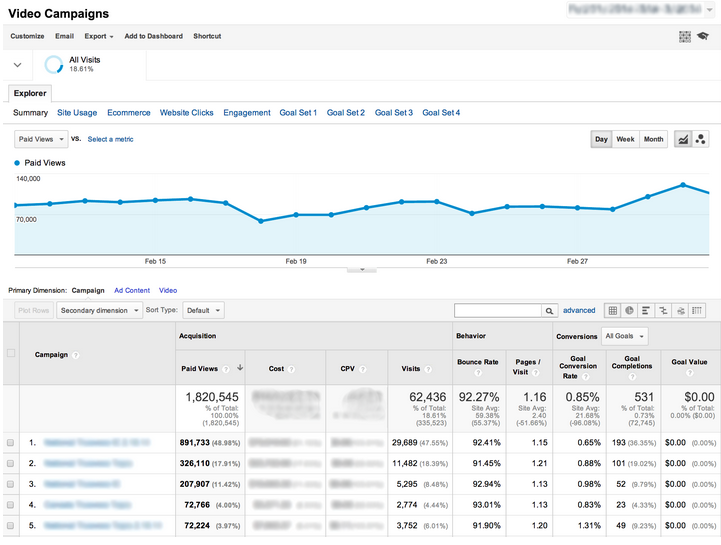 After that, head over to the new report to fine-tune your budgets and targeting. See you on YouTube! Advertisers know that video ads have the ability to reach and convince customers in ways that other formats can’t, but traditional TV ads are often prohibitively expensive, difficult to target, and hard to measure. That’s why so many advertisers have looked to YouTube TrueView ads for their video needs. With more than 1 billion unique users each month from across the world and with 40% of that traffic on mobile, YouTube is one of the best places to reach your target audience with high-quality, compelling video.